About 200 people have been killed while trying to escape over the Berlin Wall into West Berlin. Are you looking for interesting facts about the Berlin wall? Then you've come to the right place. 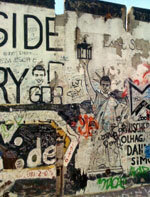 Here you can get a lot of interesting information about berlin wall and even make own comments. 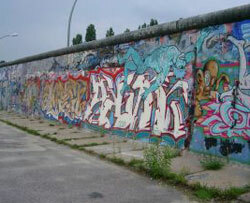 The Berlin Wall was the terrible symbol of "Iron Curtain" between the Eastern and Western Europe. The original Berlin Wall was made of barbed wire that should separate the Western Germany from Eastern and later it was made of concreate. The Berlin Wall separated thousands of families for period of 28 years + 1 day. Both Western and Easter Germany were reunited only on 3 oct 1990 and the wall was destroyed. Berlin was the capital of the Third Reich. The two parts of Germany - East and West - were separated and follow different ideologies. East Germany was a socialist path to a bright communist future, West Germany professed ideology of democracy. Germans from East Germany via West Berlin passed by migrating to West Germany. Germans from West Germany to East Germany went on shopping because the prices here are cheaper than on "democratic" side. Initially, the Berlin Wall was an ordinary barbed wire which was stretched after the approval of Soviet leader Nikita Khrushchev. This barbed wire did not give the slightest opportunity to migrate freely from one side to the other, which was an insurmountable problem and a tragedy for many families, members of which were on opposite sides of the barbed wire. East German government demanded from instructing border guards, so they opened fire without warning in case someone attempts to overcome the Berlin Wall. Because the space between East and West Berlin wall called "death strip", and only for the period of existence of the Berlin Wall is about 200 people were killed. Do You Know More Facts About The Berlin Wall? Do you have more interesting facts about the Berlin Wall? Share it with global community!